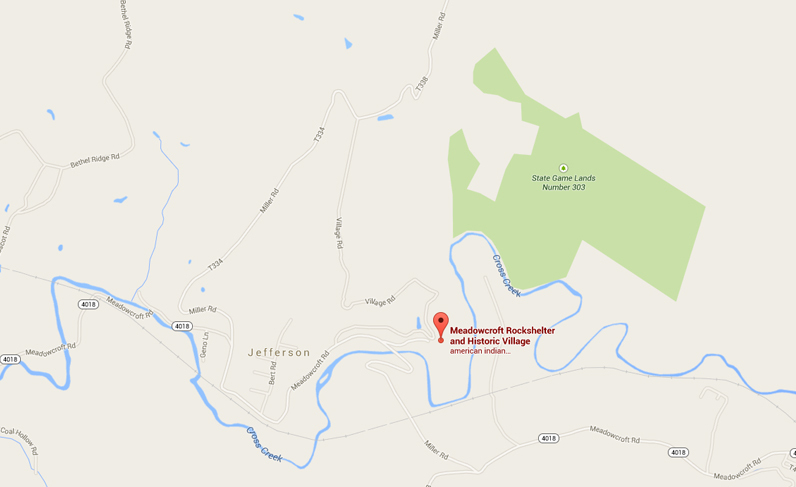 Meadowcroft is located in Avella, Washington Co., Pa. Follow I-79 South to the Bridgeville exit 54. At the bottom of the ramp, turn left onto Rt. 50 West. Follow 50 West through Cecil and Hickory. After going through Hickory, watch carefully for signs to stay on 50 West to Avella (Rt.18 joins briefly with 50, then 18 splits off to the left). As you enter Avella, watch for blue and white directional signs to Meadowcroft. The museum is located on the right approximately three miles beyond Avella. Note: Travel time from Bridgeville is approximately 35 minutes. Gas stations are located in Bridgeville, Hickory, and Avella. Restaurants are located in Bridgeville (widest selection) and Hickory. From Route 19, at St. Clair High School, take the Orange Belt (McLaughlin Road) west (toward the airport) to Bridgeville. Turn left on Bower Hill Road and then left at traffic light onto PA Route 50 (Washington Road). Follow Rt. 50 west through Bridgeville, under I-79, through Cecil, Hickory, and on to Avella. From Avella, follow the blue and white directional signs three miles to Meadowcroft. Follow I-79N to Washington, PA. Take 70W to exit 17, Jefferson Ave. Follow the directions from Washington below. From PENNSYLVANIA TURNPIKE and EAST – Exit the Turnpike at exit 75, New Stanton. Follow I-70 West to Washington, Pa. Follow the directions from Washington below. Take exit 17, Jefferson Ave off I-70 West in Washington, Pa. At the bottom of the ramp, turn right. At the second light, turn right onto Jefferson Ave. At the next light, bear left onto 844. Follow 844 for 11 1/2 miles to the junction of 844 and 231 (just past Breezy Heights restaurant and driving range). Turn right onto 231 North. Go 1 1/2 miles to the junction of 231 and 50. Turn left onto 50 West. Proceed 1 9/10 miles and turn right onto Fallen Timber Road. Go 1 3/10 miles and turn left onto Meadowcroft Road. Proceed 9/10 of a mile to the Meadowcroft entrance on right. Attention Motor Coaches: Follow the Meadowcroft directional signs onto PA 231. Do not attempt to make the right turn on PA 50 East from PA 844 West in Independence. If you find yourself at this turn proceed to the Falconi turnaround 1/10 of a mile West on 844. After turning, follow the directional signs. Follow I-70 East to Wheeling, WV. Take Exit 1A for US-40 East / W Virginia 2 North. Turn left at 10th Street. Take second left onto Market Street. Turn left at 7th Street then right onto North Main St. Follow WV Route 2 North for approximately 15 miles to Wellsburg, WV. Turn right on WV Route 27 East. Continue on Route 27 East to the Pennsylvania state line (approx. six miles). After entering Pennsylvania, WV Route 27 becomes PA Route 844. Proceed on Route 844 East for one mile then turn left onto Route 50 East. Proceed one mile and turn left onto Fallen Timber Road. Proceed one mile and turn left onto Meadowcroft Road. Continue one mile on Meadowcroft Road to the entrance on the right. Follow I-480 East to Exit 42 for I-80 East. Continue on I-80 East and take Exit 224A for OH Route 11 South toward Canfield. Continue on OH Route 11 South / US Route 30 East to East Liverpool. Exit onto OH Route 39 West / OH Route 7 South / West 8th Street and continue to follow OH Route 7 South for approximately 22 miles. Take US Route 22 East into West Virginia and take Exit 1 for WV Route 2 South toward Follansbee/Wheeling. Turn left onto WV Route 27 East / 10th Street. Continue on Route 27 East to the Pennsylvania state line (approx. six miles). After entering Pennsylvania, WV Route 27 becomes PA Route 844. Proceed on Route 844 East for one mile then turn left onto Route 50 East. Proceed one mile and turn left onto Fallen Timber Road. Proceed one mile and turn left onto Meadowcroft Road. Continue one mile on Meadowcroft Road to the entrance on right.